There are so many things that we don’t think about hardly at all. Then one things happens, or a certain season arrives and we are left to make a ton of decisions in a short amount of time. For instance, it’s very unlikely you have thought one bit about how you are going to keep your lawn healthy throughout winter since, well, last winter. However, now that November is here and the frost and snow are beginning to show up, you may be in a panic trying to figure out what you can do moving forward to ensure that your grass hasn’t entirely died by spring. The good news? With a few simple tips, you can absolutely aid your lawn in remaining healthing throughout the coming months. All you need are the six helpful tips below. 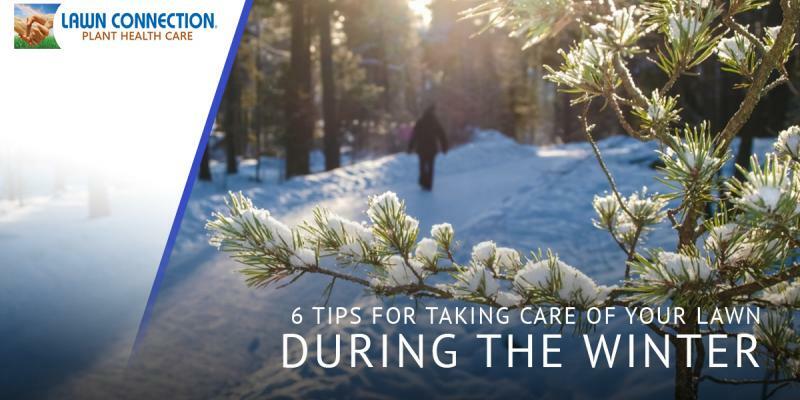 Continue reading to learn what our lawn care experts recommend for winter lawn care. Many people sort of lose track of where their lawn ends and begins when it is covered in snow. Are you shoveling the sidewalk? Are you shoveling the soil from your lawn? Who even knows? This is why we recommend that you mark your lawn before the first snow ever falls. Simply place markers, we would suggest small flags, so that you will know where you should be shoveling or using your snow blower once you can see your grass. You can also choose to add reflective markers along the streetline so that snow plows are sure to not cause any damage to your yard on accident. If you planted any plants near the street at your home last spring or this fall, you aren’t likely to see them remaining in very good shape once it gets warm outside once again. Placing plants near the road is a lot like asking for them to die. When there is heavy snowfall or plows push the snow to the side of the road and on top of your plants, they are going to be crushed. Unfortunately, if you’ve already done this, you may just have to pray for the best this winter. We also suggest that people try to avoid using salt to melt the snow on their driveway, sidewalks, and front patios. We would suggest that instead you use sand or magnesium chloride to melt down the ice that is just waiting to cause you a painful fall. Using these products instead will prevent any damage from being done to both your grass and the plants in your lawn. Not to mention, using salt in extreme temperatures can even damage your sidewalks, which would not be cheap to fix should you need to. People who love their lawns often have quite the vendetta against snow. After all, how are they to know that the grass they have dedicated themselves to caring for the last three seasons won’t be destroyed in one fell swoop? What many of these people don’t know is that snow actually works as a wonderful insulator for the roots of your grass, therefore protecting your lawn. Additionally, the snow will work to water your landscaping as well when the snow begins to thaw. One of the best ways to ensure your grass remains healthy is to not walk on it. Make sure there is a clear path of concrete for people to walk on when they come over to your house so that they do not decide to take a path that may look less dangerous through your lawn. Much of the time, when we are clearing the snow from our driveway or walkways we don’t pay a ton of attention to where we are relocating it to. Be sure that you are not piling large mounds of snow on top of the plants in your yard. Doing this could cut their lives extremely short as they would have been crushed in your snow removal process. If the thought of snow this winter is stressing you out in regards to your lawn, don’t wait another moment to contact Lawn Connection today. We are New Jersey’s trusted lawn care company and we would love to be able to offer you some tips or our services if they are what you need to make sure your grass make it until spring.